In the depths of the south east corner of the Court of the Pitt Rivers Museum, a large glass topped case contains a curious mix of objects on the theme of Sympathetic Magic. 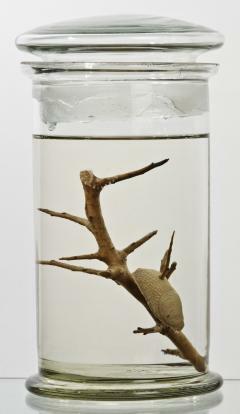 Prominent in the case is a glass specimen jar filled with alcohol and containing a slug impaled on a thorn (1898.71.1). Originally black, but now bleached white by years of being immersed in formaldehyde or a similar solution of alcohol, the slug represents one in a long line of cures for warts. It was purchased by the Museum in July 1898 from Thomas James Carter of Oxford and is the Oxfordshire version of a cure used in several parts of the UK. Charm for Warts, Oxfordshire. Go out alone & find a large black slug. Secretly rub the underside on the warts and impale the slug on the thorn. As the slug dies the warts will go. Other charms for warts using molluscs include piercing the mollusc with a pin as many times as your number of warts, rubbing the wart with the mollusc and killing the mollusc, and impaling a mollusc and blowing across the hand while pointing at a new moon.